It is almost impossible to formulate a list of rules for the construction of a bonsai. In art, rules are meant to be broken and sometimes bonsai which break all the rules are the most dramatic. Perhaps the word “concepts” or “guidelines” would be more appropriate. Most bonsai have a triangular shape, three primary branches, a viewing front and several of the elements discussed previously such as good root displacement, trunk taper and the like. What follows is a “formula” for creating a classically designed bonsai. There are about 12 classical bonsai styles types into which plant material can be shaped. 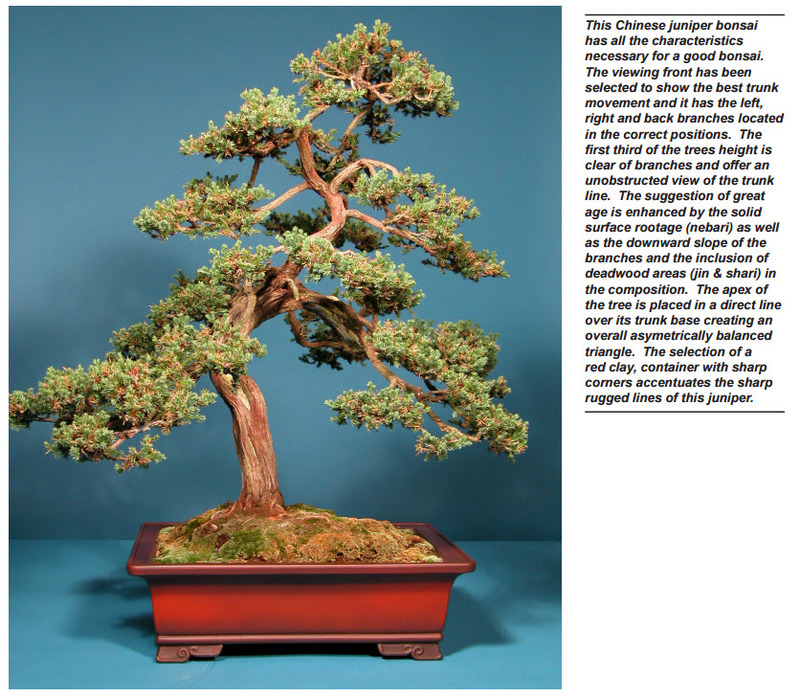 Described below is the classic design parameters for a formal upright bonsai. 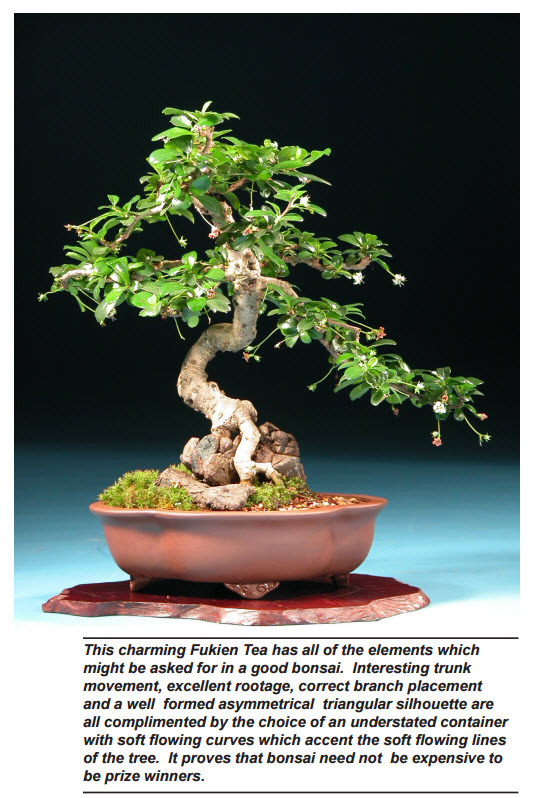 It is the base style from which all other bonsai shapes are derived. Regardless of what style you are making or what kind of plant material you are working with… it will ideally contain the elements described below. Formal Upright Bonsai: Definition – A tree who’s trunk is perfectly straight and who’s apex (top) is in a direct line above its base. The first task required by the artist is to determine the preferred viewing angle of the tree and its approximate overall height. These determinations are subjective in nature and would be based on factors that the artist feels are most important such as: trunk shape and movement, surface root placement, trunk taper, branch placement, etc. A bonsai needs to look attractive and balanced from all angles, but usually there is one side of the tree that the artist intends for viewers when displayed at an exhibition. This position is known as the front and all bonsai must have one. All bonsai have a triangular shape. Sometimes that triangle looks more like a semicircle, but the point is mute. Branches on you tree must be longer at the bottom and become gradually smaller as you approach the top of the tree. To do it any other way will create something which looks unnatural. Look at the old trees in the environment around you. They all follow this pattern. The triangle is a theme that runs through all bonsai designs. Since a good bonsai artist strives for asymmetry in their creations it is seldom an equilateral triangle. Nevertheless, a triangle is always present. A single tree presents a single triangle. A twin trunk tree presents two triangles which are arranged to create one overall triangle. Cascade bonsai present triangles which are turned upside down. Forest and group plantings are composed of a series of triangular groupings… usually a minimum of three… which are then arranged to complete an overall larger triangle for the entire composition. Newcomer to the art would be well advised to master the triangulation of a single tree before attempting for complicated compositions such as cascades and forests. Primary or Number One Branch. This is always the lowest, longest and thickest of all the branches on the tree. It occurs about one third of the way up the trunk and emerges from the trunk or either the right or the left side of the front (artist choice). It should come forward from the front plane of the tree. Secondary or Number Two Branch. This branch is placed on the opposite side from the Primary branch and above it. It is slightly shorter and slightly thinner and located in the second third of the trees total height. Back or Number Three Branch. This branch is located between the number one and number to branches and in the back of the composition. It is somewhat shorter than the Secondary branch and also located in the second third of the trees total height. Additional Branches. All remaining branches on the tree are located in the upper third of the trees total height and gradually become shorter and thinner as they approach the apex of the tree. These branches follow the same pattern as the three primary branches as they go up the trunk. ie – either left, back, right or right, back, left. After all the elements above have been identified the following formula for the construction of a classical bonsai can be applied. A good bonsai has a triangular shape. It has a front designed for primary viewing, but looks good from all angles. It is clear of branches for the first third of its height and contains the three primary branches (included in most bonsai designs) within the second third of the trees height. The final third of the trees height contains the remaining branch structures. The trunk is clear and visible for the first two thirds of the trees height with the remaining branches beginning to cover the trunk line in the final third. The branch structures are clearly layered, well organized and asymmetrically placed on the outside of trunkline curves whenever possible. The top of the tree “bows” slightly toward the viewer and the apex of the tree (in the case of an informal upright style) is in a direct line over the base of the trunk. There are no hard and fast rules in bonsai… only guidelines. And there are no perfect bonsai. The trees initial creation as well as its gradual development over the years, is a cooperative venture between you and the tree. It is not a contest of wills. The formula is designed as a guideline to help you visualize what needs to be done. Understand it and how it works to your advantage by helping to create asymmetry and a feeling of age in your creation. It is not intended to be a hard fast set of rules and should never use it as a wooden club to force your tree into artistic submission. If the classical design formula is not working then forget the formula for a moment and consider the subject itself. It may well be that your tree does not have a viable number one branch or that some other design element called for in the formula is missing. It happens more often than not and frankly is simply not that important. What IS important is that YOU have studied the formula enough to understand that a primary branch is needed. That understanding will allow you to modify the bonsai’s design to compensate for such missing elements. The final product is the important part… not adherence to the formula. Trees must have balance and grace. But there is balance in unbalance and symmetry in asymmetry. No two people will create the same bonsai in the same way that no two people would paint exactly the same picture of a bowl of fruit . Many possibilities are available in the chosen plant material. It is up to the artist to select and create the one which best serves his purpose.